Something about the clean lines of the hot yellow flowers topped with a symmetrical bright red cap recalls a miniature explosion in space. Wiry stems to 14″ support clouds of this starry flowers from late March for and extended period well into summer. New growth is mottled with maroon over an initial hue of amber before settling to soft glossy green. All together this is a great performer for part shade to shade in rich to average well drained soil. Regular summer water not only refreshes these tough shade plants it will spur them to increase. The rewards often are not apparent until the following spring. Cut away the evergreen foliage in late winter to reveal the new years flower as well as highlight the pretty new growth. Good deer resistance. Spreads moderately fast to form a clump 20″ wide in 5 years. Nice cut flower as well. Very easy to grow. 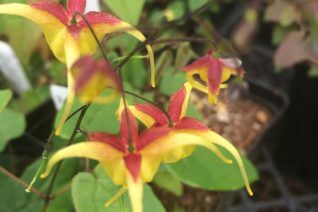 One of our selections of a hybrid barrenwort with stunning sunset colored flowers for a long period in spring and often into early summer. Pendant star shaped flowers are orange and red with white tipped spurs. Easy to grow evergreen clumping perennial for part shade to shade. Rich, moisture retentive soil with consistent summer water. Mulch annually with compost to drive vigor, health. New foliage emerges amber with darker red flecks throughout before settling in to medium green in summer. To 14″ x 14″. 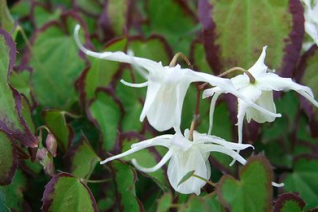 We love this little multidimensional barrenwort that pairs fresh green leaves outlined in black in spring while simultaneously producing clouds of star shaped crystal white flowers. 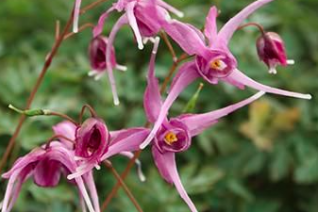 A compact smaller growing plant to 10′ tall and with good care spreading to 18″ wide. The remarkable new growth morphs to solid fresh green in summer. Blooms March to May in part to full shade (really doesn’t like sun so don’t fudge it). Regular summer water. Rich, moisture retentive hummus rich soil. Add an annual application of compost and even a handful of organic fertilizer in spring to increase vigor- give it a good life. Completely winter deciduous. Long lived perennial. 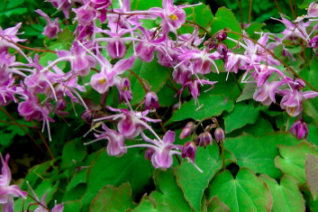 A really good purple flowering barrenwort with new foliage that emerges deep purple and accompanies the mid-violet colored flowers that have spurs tipped in white. A really good effect on a sophisticated long lived perennial. To 1′ tall and 2′ wide in rich, moisture retentive soil. Add a layer of compost annually and water regularly through the dry summer months. Completely winter deciduous. One of the best purples that we’ve grown. Easy plat. 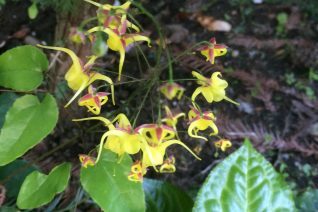 One of our very best Epimedium introductions. Incredibly floriferous hybrid with golden yellow almost shiny flowers with a bright red cap on top. They appear in clouds above the foliage from March to June. New foliage is amber colored before settling in maturity to soft green. Evergreen but we think it looks much better if you remove the tattered foliage from the previous season in February- cut it to the ground to make way for a fresh new season. 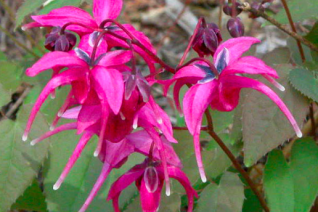 Blooms very heavily and they are vivid enough to spot from a distance. Vigorous clumping perennial for part shade to shade in rich, well drained hummusy soil. Regular summer water will spur repeat bloom but once established it easily endures summer drought. Avoid hot sun. to 20″ tall in bloom making a clump about as wide. Moderate deer resistance. 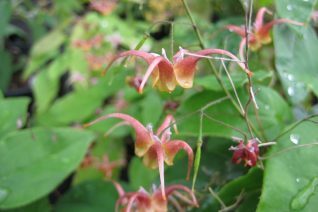 Can’t help but love the excellent performance of this exceptional barrenwort. 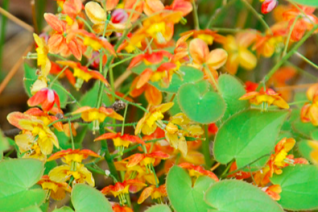 From pretty scimitar shaped green leaves rise wiry stems supporting clouds of star shaped flowers. The center of each flower is plum colored and the extending spurs are crystal white for a great bicolor effect. Extraordinarily long blooming from March well into summer- and sometimes longer if it feels like the weather has been perfect. Semi-evergreen to evergreen but we heavily advocate cutting the whole thing to the ground in February to make way for a fresh new year. 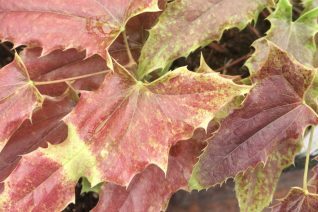 New foliage is heavily mottled in red before settling to mid green. Part shade (open north exposure like the cool north side of your house is fantastic too) to shade in rich, well drained soil with consistent summer moisture. Spreads to several feet wide in several years. 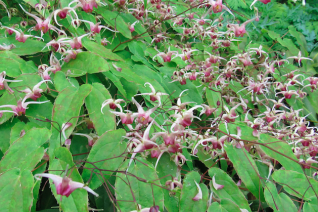 A truly great, long lived Epimedium that is very pretty all around. Moderate deer resistance.